Investors will be looking for more than just strong sales growth on Tuesday. Home Depot (NYSE:HD) is set to announce its second-quarter earnings results before the market opens on Tuesday, Aug. 14. The retailer's shares have underperformed broader stock indexes so far in 2018 after unseasonably cold weather depressed demand in the first quarter. But investors can expect solid rebound in that core growth metric on Tuesday, along with improvement in a few other key operating and financial metrics. Sales gains were 4% at the start of Home Depot's fiscal 2018, and that figure represented a sharp slowdown from the prior quarter's 7.5% increase. Yet management didn't blame poor industry conditions or moves by competitors like Lowe's (NYSE:LOW). Instead, the deceleration was pinned on a delayed start to the spring selling season, which tempered demand for warm weather products. The good news for investors is that in past years that followed similar weather patterns, Home Depot's seasonal sales jump simply shifted into the second quarter from the first quarter. That's exactly what CEO Craig Menear and his executive team are predicting this time around. In fact, comparable-store sales rose by double digits in the first few weeks of the second quarter, according to management, and so investors should see a strong top-line number this week. The more useful metrics to watch will be six-month figures for customer traffic and average spending, since they will provide a clearer picture of overall sales trends. In the prior-year period, traffic levels rose by about 2% while average spending per visit improved by about 4%. Home Depot is one of the retailing industry's most profitable businesses. Its 14.4% operating margin over the past year, for example, far outpaced Lowe's corresponding figure of 9.4%. Home Depot also dramatically outperforms broader retailing peers like Walmart and Target, whose margins are below 6%. 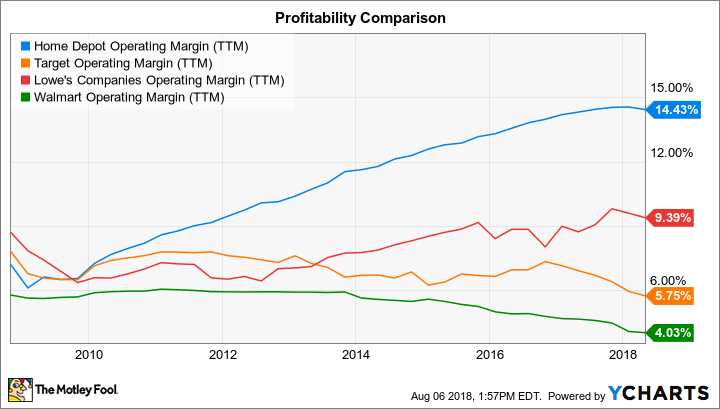 HD Operating Margin (TTM) data by YCharts. Investors can look for continued market-leading results from the home improvement specialist this week, but gains might be muted. After all, the company has warned investors to expect slight declines in operating margin thanks to elevated spending in the digital sales channel. Lowe's, meanwhile, has promised to step up its competitive game after hiring Marvin Ellison, a former top Home Depot executive, as its new CEO. More effective market share challenges from its smaller rival might pressure Home Depot's bottom-line profitability. With the first half of the year behind it, this would be a natural time for Home Depot's management team to update their outlook to reflect all the latest industry trends. A year ago, for example, they lifted their 2017 comps forecast to 5.3% from 4.6%. As it stands now, the retailer is predicting comps of 5% in 2018 and a 28% spike in earnings that's driven by roughly steady profitability and a sharp drop in tax payments. Looking further out, Home Depot believes it can achieve $120 billion of annual sales by 2020 -- up from $100 billion in 2017 -- as steady growth in the home improvement industry continues. While noting negative trends like rising mortgage rates, executives have said that other key metrics -- including household formation rates, home prices, and job growth -- all suggest that the recovery could have many more years to stretch on before the next cyclical downturn. Investors will find out on Tuesday whether that optimistic assessment of the industry has changed at all over the last few months.